Not in the outsourcing business? See other use cases. In the outsourcing industry, customer retention is key. For contact centers, virtual assistants and other outsourcing companies, long-term client retention is crucial to stable revenue growth. But often, billing and invoices can be a major stumbling block. Without automated systems to ensure client retention, revenue can be unstable and billing disputes can pose a problem for collections. You have a promising contract with a valuable client. You’ve been hired for a major project, with the potential for recurring revenue. You might hire new staff to handle the influx of new phone calls or customer service requests. You budget for increased revenue resulting from the new engagement. But just a few months later, the project ends. Suddenly, your company loses a major source of revenue. You may have to lay off staff, cut expenses, or even downsize your office. Although it’s not always possible to make every project permanent, automated billing can go a long way. By streamlining your billing process, you make it easier for clients to sign on for long term engagements, eliminating the usual stumbling blocks to long term projects (such as billing and invoice-related paperwork and other red-tape). That’s why we created ChargeOver—a cloud-based payment management application that automates your entire billing and invoicing process. Tasks that you used to do manually—such as sending invoices, charging client credit cards, and updating spreadsheets—can be done automatically with ChargeOver. At call centers, financial data management represents a significant cost in terms of time and money. Most contact centers have entire departments dedicated to recording and processing financial data. ChargeOver saves you the resources you would ordinarily spend on these functions by automating them. 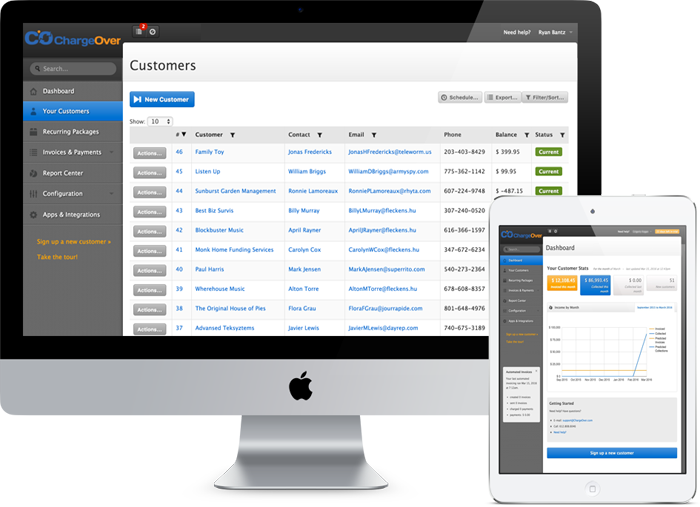 ChargeOver is also great for or independent outsourcing companies. Many outsourced service providers—such as virtual assistants—are self employed. If you’re handling your invoices and accounting by yourself, ChargeOver saves you the time you’d normally spend on these tasks, freeing you to focus on more essential business functions. ChargeOver makes client retention a breeze. One major sticking point for outsourcing companies is client attrition. Outsourcing is a highly competitive industry. Thousands of firms around the world compete for a limited supply of contracts. One consequence of this is that clients tend to switch providers frequently, and may drop existing contracts on a moment’s notice. Automated billing helps you retain clients long-term. By automating the billing process, ChargeOver provides an easy, simplified experience for your clients, dramatically reducing the risk of attrition. Save time on data entry and invoice creation with automated billing. Once you set up a payment plan and sign up a client, ChargeOver handles all subsequent billing tasks, from charging the client’s credit card to syncing accounting data with your bookkeeping software. ChargeOver lets you set up recurring payment plans for your clients. You have control over all payment terms, including rates, payment schedule, and more. Offer your clients payment plans on any terms they wish, and build a portfolio of recurring revenue streams that will grow and expand your business. In the outsourcing industry, retention can be tough. With thousands of providers around the world to choose from, clients may switch providers at a moment’s notice. ChargeOver remedies this situation by providing an easy, streamlined billing process, which reduces the risk of arguments over bills and other incidents that can end relationships prematurely. Different clients have different needs. Accordingly, ChargeOver offers a number of billing options: recurring, metered, one-time, and more. When you offer clients payment on their own terms, you improve your acquisition and retention rates by giving clients the ability to choose contract terms that meet their changing needs. We’ve made it super easy to get started with ChargeOver. You are under no obligations, and there are no contracts to sign. Simply create your ChargeOver account, and start setting up payment plans in minutes. And, your first 14 days are completely free. You can test drive all of ChargeOver’s features during the free trial period, and if you decide you want to cancel, you won’t be charged. It’s easy to get started, and completely risk-free.